Have started doing some "smart-trainer" stuff and need to track Resting Heart Rate to get a feel for whether I'm under the weather, overtraining or just being lazy. Chest straps are too uncomfortable to wear all night, every night, so I bought a Fitbit Charge HR, used only at night just to get the RHR. It was doing this, although a bit awkwardly since it divides each day between midnight-to-midnight and reports any day's reading as the average of a.m. (values collected from last midnight to waking) and p.m. (values from going to sleep until midnight). I'd have preferred it to record values straight through from going to bed until getting up the next day. But my Fitbit has now broken/stopped irrevocably and I'm looking for some better kit. 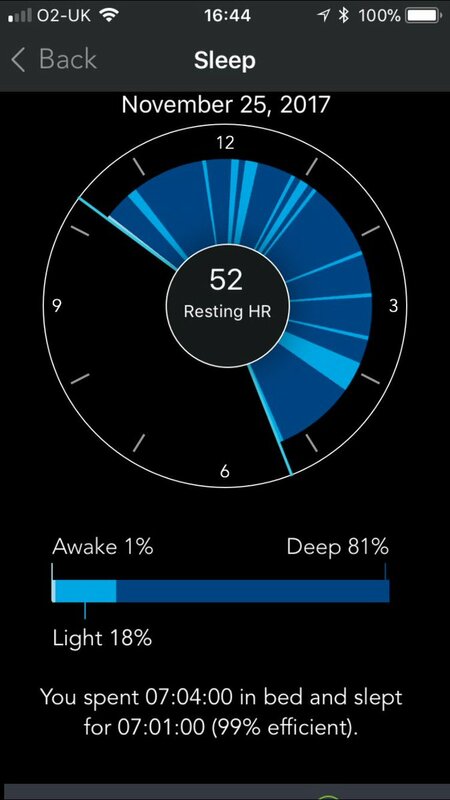 As far as I can tell, many "activity trackers" will advertise "sleep analysis", telling me how long my deep and REM sleep periods and awake time are, but not necessarily the RHR. Does anyone have any suggestions for some decent kit, wrist-strap based, that will do what I need? I have a Garmin vivoactive HR, and it seems to work fine (I've had it about a year). I'm not sure how it calculates RHR, though. And I don't pay much attention to the sleep tracking, as it doesn't seem to differentiate between actually sleeping and lying in bed awake not sleeping. I wear mine all the time (except in the bath/shower - that's when I charge it), but I still use a chest strap when out cycling, mainly because it's less faff to use with my Edge than setting the vivoactive to broadcast HR. If you are in the iUniverse, an Apple Watch does this. Jaded. RHR 49, but has been recorded as low as 37, 38 this summer. I looked at the Vivosmart manual online but couldn't see any reference to RHR. I guess it would be a matter of simply strapping it on when I go to bed/sleep and removing it in the a.m. and then just reading the average HR through the period? I hadn't considered the Apple option, largely because I can't get on with iTunes/my iPod very well, and I'm all Windows (or Android for 'phone and tablet) but if the Apple Watch works properly, I would have to consider it. I'll go and do some Googling. I'm now on a Garmin 935 for everything. My old 235, which does RHR and sleep (with the various inconsistencies and limitations of all these devices) is on eBay finishing in a couple of hours. I actually have grown to like the evolving Garmin environment. I have a vivosmart HR- wear mine all the time and use it for broadcasting. I agree with phanta that the sleep tracking is rubbish- way worse than a fitbit. It thinks I'm asleep when I'm knitting. OK. I have to rule out the Apple Watch. Enquiries have established that I'd need an iPhone or other Apple hardware and it won't work with anything Windows or Android. Sojournermike - the 935 looks interesting; a bit overkill for what I want though. fboab - thanks for the Garmin Support link, that was helpful. Presumably your comment about sleeptracking relates to the analysis of sleep type/quality rather than the actual heart rate? All I need is the average or resting HR expressed as bpm. Oh and "broadcasting" - ? Not sure what you mean here. I bought a Mio Fuse to do this as my LBS was selling one off half price (£50). You manually activate sleep mode when you go to bed and turn it off when you wake. It determines deep from heavy sleep through movement I guess so sometimes can't tell the difference between just lying absolutely still and deep sleep. You need the MioGo app on your phone to download the data, I have an iPhone but I think the app also works with android. Sometimes (once a month-ish) it fails to download sleep data properly. It seems to track resting HR well. You may also get a bargain on Mio gear because they recently announced that they were stopping to make hardware and concentrating on apps. A shame because my Mio HRM is great.